‘A Lady Seated on a Balcony’, an oil painting by Alfred Louis Andrieux, 1879-1945, desperately needed attention. 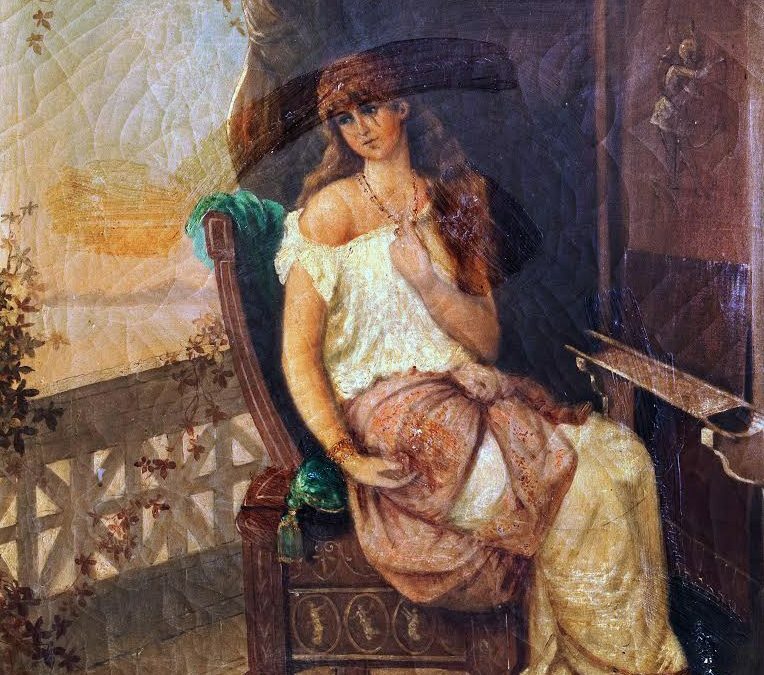 It depicts a scene from Greek Mythology showing Penelope stitching a tapestry whilst waiting for the return of her husband, Ulysses. When member James Hilton heard that we were raising money to pay for the conservation of this painting he immediately offered to give £1,000 for the purpose. He told us that his wife was called Penelope and they had recently celebrated their 60th Wedding Anniversary. What a kind and lovely gesture! So the very pleasant Reception Room in the Town Hall filled on the 14th June 2018 with members of the Friends and invited guests who saw this painting looking again as it must have looked about a century ago when newly painted. Phillip Bourne, Conservation Officer: Pictorial Art, kindly came along to give us a very interesting account of his many hours of painstaking work he carried out on the dirty, damaged ‘Penelope’. Mr and Mrs Hilton were presented with a reproduction of the painting on canvas as a memento and to show our gratitude. Tea and coffee, cakes and biscuits were served and it was a very happy occasion. One of the reasons the Friends charity exists is to raise money for the conservation of items from the LSA Art Collection. In the 10 years since we started we have been pleased to be responsible for many lovely paintings and sculptures being cleaned, repaired and treated in such a way that they are preserved for many years to come. As our membership has grown and we have managed to accumulate much needed funds, the Friends have paid for a large part of the cost of the work. However, we have been so very grateful for the generosity of several individuals and societies who have given large sums of money to enable this work to be done. The event which took place on Thursday 14th June was a celebration of the conservation of a painting helped by one such generous donation.